So Much House for Such a Small Price! Cash Investors See this! The Whole Neighborhood has transformed and updates and remodeling going on up and down the street! THIS IS NOT A MANUFACTURED HOME at Manufactured home price! Great Tenant that Has Been there for Years and would like to stay, currently on Month to Month agreement and would sign a lease. 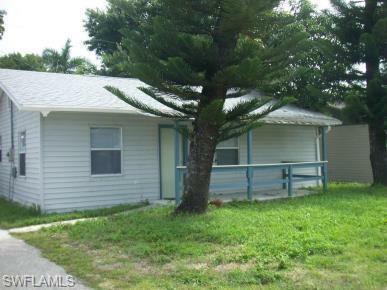 OLD FLORIDA Style, w/ Wood Flooring, So Cute and So close to downtown Ft. Myers and the River! You Can WALK to DOWNTOWN district of FORT MYERS and enjoy RIVER VIEWS and shopping just around the corner! Great opportunity for an investor or cash buyer! This old Florida style home has a split 2 bedroom, 1 bath plan with a HUGE MASTER BEDROOM, Big Walk-in Closet and comfortable floor plan. This is a unique opportunity at a low price. Set up your appointment today! This is an As-Is Sale, bring your best offer! Wonderful Tenant would like to stay but also is on Month to Month agreement, so you can buy and move in, if you want a inexpensive home with easy access to US 41! Listing courtesy of Janine Fine of Jones & Co Realty.